Our set of 4 paint and clay palm printers includes a wonderful variety of patterns: scribble design, concentric dots, star bursts and a multi-sized dots array. You'll be stamping your way to creative arts and crafts fun - making wrapping paper, cards, borders and decorations! 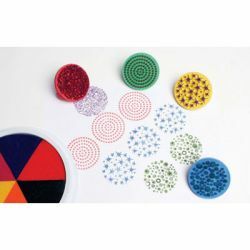 Made of long-lasting hard rubber, each circular stamp has a 2" diameter surface area. The handle easily slips onto a child's hand. Hands down, this is one of our best new items! Clean-up is convenient with just soap and water. For 3 years and older.